Maximum size: 150 mm (Kay, 1979). Identification: This is a broad, moderately firm species with closely spaced clusters of elaborate tubercles on its notum. The sides of the central tubercle in each cluster are usually covered by multiple rings of smaller tubercles. The height of the secondary tubercles is variable. Its body ranges from cream to pale rose and lighter bands radiate from the tubercles to the margin of the notum. 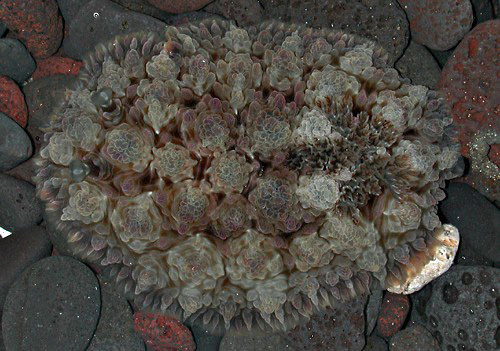 Dark brown patches may be present between the tubercles but they are usually less extensive than in Dendrodoris carbunculosa. It may be distinguished from D. carbunculosa by its translucent notum, more elaborate tubercles and the prominent white spots on the underside of most animals. (Note 1) In photos taken with a flash, it often appears to have light lines running along the crests formed by the rings of smaller tubercles. (Note 2). Distribution: Big Island, Maui, Lanai, Molokai, Oahu and Kauai: widely distributed in the Indo-Pacific. Photo: CP: 120 mm: Hekili Point, Maui; Nov. 4, 2002. Note 2: Perhaps, the translucent tissue of the notum acts as a lens, focusing the reflected light of the flash in such a way that it is concentrated along the crests? The lines are generally not visible to the eye. Note 3: There's some chance that a third, cryptic species may be complicating the separation of D. tuberculosa and D. carbunculosa. If animals labelled as "tall tubercles" consistently lacked spots on the underside that might suggest a further split.